Don't leave me to check out the other sites just yet! We still have a lot of ground to cover here! 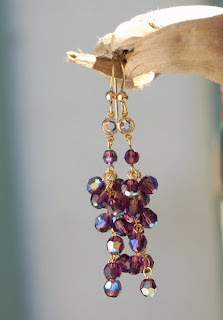 The Handmade Gold Dangle Earrings Swarovski Item 008 are beautifully crafted from AB Swarovski crystals on a 14K GF chain. They are a length of 2 1/2" long. 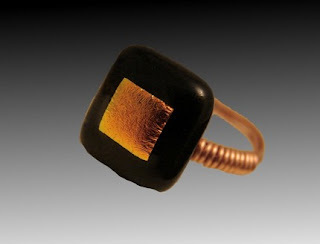 This ring is actually a button, fused glass and solid copper wire that comes in a size 5 1/2. 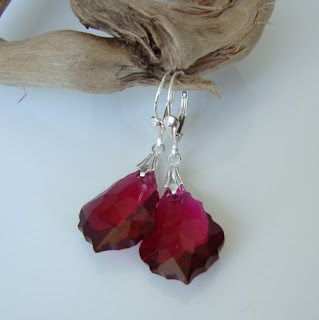 This gorgeous Ruby color Swarovski crystal and silver earrings are 1 1/2" long. Have I ever told you all that one of the hardest things about doing these features is that I want to rush and buy things from every shop! Well if ever I haven't told you, it is really hard to resist being a shopaholic at times! For one of you lucky readers, though, you will not have to spend a dime to get a wonderful piece of My Way to Say jewelry. 1. Post a comment here about My Way to Say about an item from the shop that you love for one entry. 2. By being a follower of Joy de Vivre Design you get a second entry. So if you aren't already just click that little follow button and you are all set! Don't forget to come back this Friday and see if your name is in the center of a confetti party! ah! my favorite is definitely the first pair of earrings. They are divine. The dangle earrings are calling my name! Beautiful. They are all so beautiful but I love that ruby swarovski earrrings!! Wow - beautiful things! 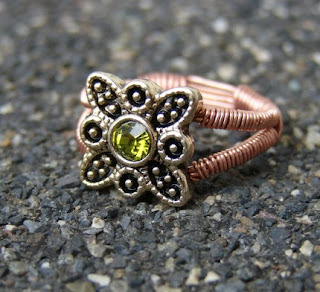 My favorite is the fused glass wire wrapped ring! Soooo pretty! Oh my, what lovely Pretties! Gorgeous! Need Some Fun Ideas for Halloween Goodies? It's National Chocolate Cupcake Day!